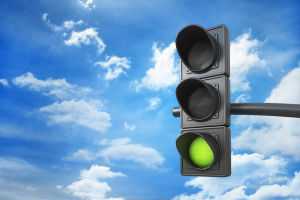 Heaven has given a green light in the Spirit for many to MOVE FORWARD! Where there have been hindrances before, now a path has been cleared for immediate access. There is an increased level of GRACE for those who speak to the hindering mountains before them and declare the Lordship of Christ in their situations. This is not a time to back down or to wait. Heaven is watching and waiting for you to speak the word of the Lord to that mountain. An unusual occurrence got my attention the other day when I pushed the “add minute” button on my microwave to reheat my coffee. Instead of the usual minute being added, only ten seconds were added. I thought I did something wrong so I pushed it again. Same thing. Only ten seconds added. I looked more closely because the only options on the front panel were “add minute”, “defrost” (which adds 2:30 minutes) and the clock. There was no way I could have hit another button by mistake. I hit it a third time. Ten seconds. It was then I looked at clock on the stove top right below the microwave. It was at 5:55. Interesting. I realized this was not a mistake. God was trying to get my attention. (I went back later to test the microwave again and it added a minute just as it should and it has worked right ever since). Though this Scripture is often quoted to describe the power of the Spirit, we miss an important point. WE have a part to play in this! It is only AMID THE SHOUTS OF GRACE that the Lordship of Christ is established! The power of the Spirit removes the mountain, but it is OUR declaration of Christ, the Chief Cornerstone, that ushers in His kingdom! Why is this important? Because it nullifies and cancels the thoughts and attitudes we carry that the mountain is too big for us – or even God. This action on our part strengthens our faith and releases the power of heaven to act on our behalf. THE BALL IS IN YOUR HANDS! It’s time to move, to act, to speak. You are not playing defense right now, but offense. It’s time to take that mountain for the Lord! You have a measured time allotted for this where My Grace will open the path and give you a clear shot. Run with this! Time on the clock is short and you must act decisively. Declare My Lordship and see those mountains crumble. As you speak the FAVOR and BLESSING of heaven into your situation, I will be lifted up and reign. My GRACE will multiply your efforts to bring forth much fruit and great victory. Much of this will happen through our prayers and PRAISES. Earlier this month, I wrote that God is depositing a spirit of weeping upon various people for prayer. Just this weekend, someone shared with me that they experienced this very thing in a place and time where they least expected it. God’s heart was supernaturally deposited in them in order to intercede with power. What we may seem to lack in our flesh, God is sovereignly depositing in our spirits so that we can accomplish the task He has called us to. In like manner, He is extending His grace to give us boldness to declare His Word. Where we may feel inadequate or weak, He will empower us to speak with confidence and authority. I hit the “add minute” button 3 times. There were 3 “5’s” on the time mark (5:55). When you speak something once, you don’t have to commit. When you say it twice, you’re willing to test it out. But, when you speak it the third time, you mean it. This is the attitude we need in our prayers. It’s not a request. It’s a command for every mountain to be laid bare and every knee to bow to the name and Lordship of Jesus! Run the play before you. Declare his Lordship. Take the shot. With His Grace, you can’t miss. 1 Comment on It’s Time to GO! Oh Wanda, this so resonates with me. For the past year, 555 has been following me relentlessly. Doing my own research, I’d come to believe that 55 (being the sum of all the numbers from 1-10) refers to the end times (particularly with respect to overcoming), and that 555 takes that a step farther, referring to our Ruling and Reigning with Him. So all that you mentioned about the shouts of grace, our declaration of Christ, the urgency of the times – I feel like the Lord has been highlighting this EXACT thing to me. The whole Zechariah account is awesome. God has been teaching me about the power of the decree to tear down strongholds, activate angels, and create opportunities, and I agree that this kind of fearless faith will be needed more and more in the days to come.